GOT7: Please give lots of love to ‘Stop Stop It’~ Thank you! 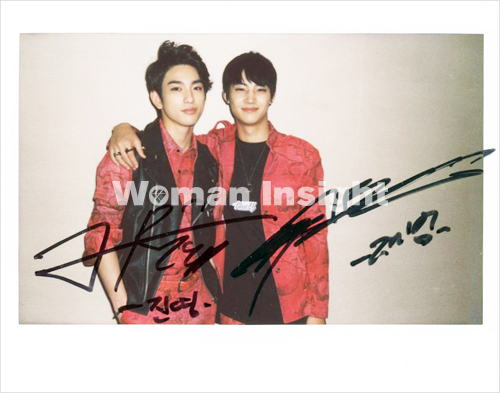 JB: Come and get it! 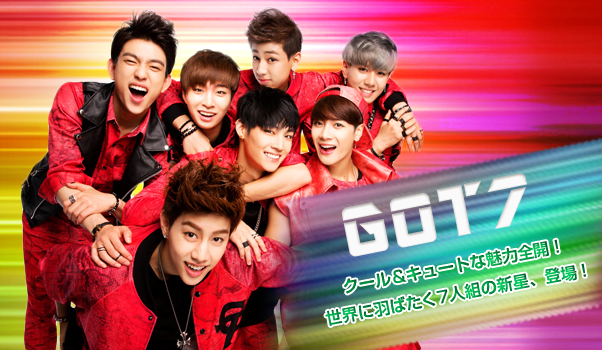 GOT7! Hello. I’m GOT7’s leader. We have finally come to greet our fans with our first full album, ‘Identify”. 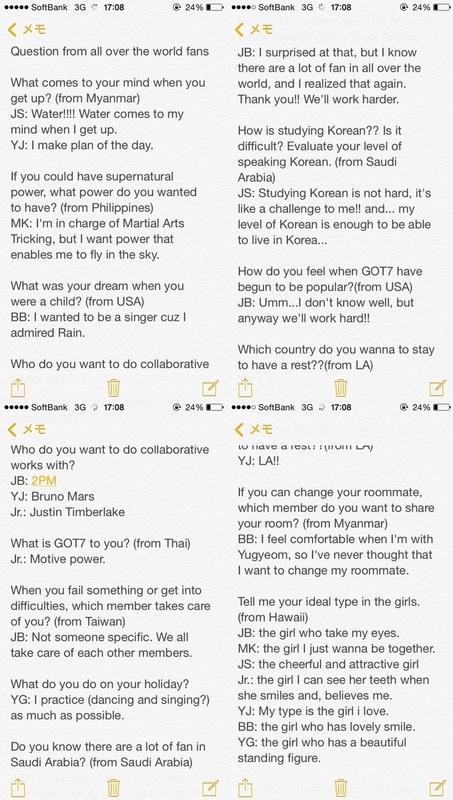 Here is GOT7’s Identify mini-Interview, where GOT7 personally ask the questions and GOT7 personally responds! 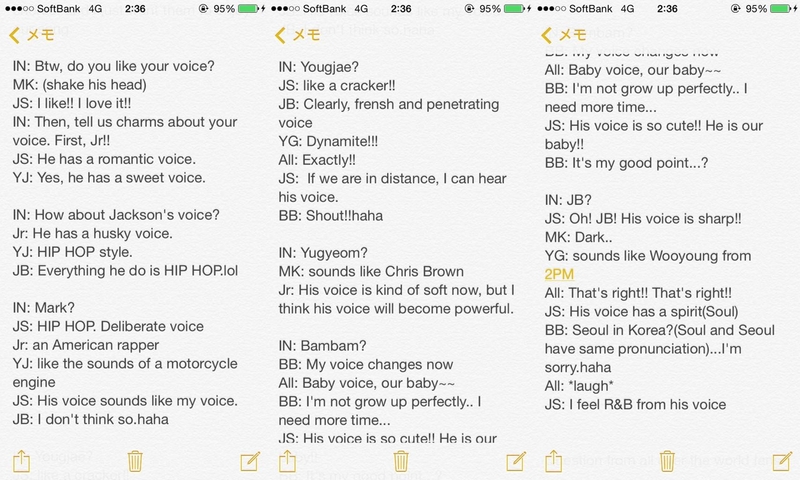 JB: Bambam~ After ‘A’ promotion Ended, how did you spent your time in the resting period? Bambam: Eyy Hyung~ when did we rest (T__T). 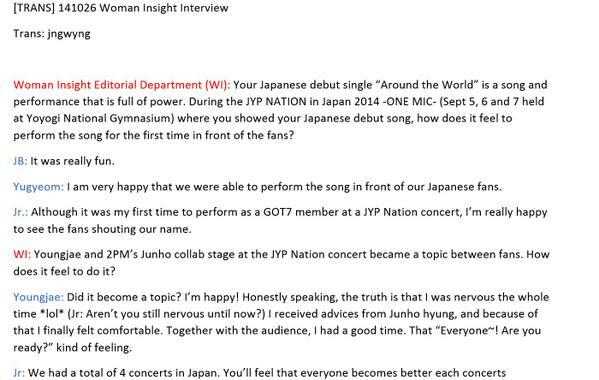 We also did JYP Nation concert tour, our first single came out in Japan, and we also went around for our Zepp tour. During that time i really missed all our Korean fans! Bambam: All our fans have seen the music video for our title track this time, ‘Stop stop it’, right? As the main character of the music video, JB hyung, please introduce it a bit! JB: The fact that it transcends the present and the future seems to be its biggest characteristic. I go to the future when i fall off the rooftop of a buiding in the present. When we were filming, it was very tiring, but it was the most impressive^^ By the way, while i was acting up storm, is it true that all of the members went to sleep….? JB: The name of our full album is Identify, so what is the charm that is only GOT7’s? Jr. : Mmmm… The charm of both boys and men?^^ Not long ago, if A promotions showed off our cute boyish charm, it seems like this times ‘Stop stop it’ is a step towards the cool man! Jr. : Let’s try to talk more about our tittle song ‘Stop stop it!’ Park Jinyoung PD-nim said that ‘Stop stop it’ is a hit song like Wonder Girls sunbaenim’s Nobody and 2PM’s Heartbeat. He even said it on SNS, honestly! When you first time heard the tittle song, were you confident that it’d be a daebak song (smash hit)? Mark: The dance point for ‘Stop Stop It” is? Yugyeom: If i have to only pick one….. Stop it dance? Matching the lyrics of saying stop it, shaking our hands from side to side is the point. Since the movement is extremely easy, I think it can be a dance that the entire nation can follow. Yugyeom: Then I shall ask personal question! Not long ago, 11/13, Thursday, it was the college entrance exam day. Our Youngjae hyung also took the exam with the test-takers. Youngjae hyung! How did you do on the exam? Youngjae: Haha it’s embrassing^^. I was extremely nervous, but at the testing site, many people came and cheered me on, so I diligently took the exam! Of course, our member also cheered me on^^ Well done to all the examinees! Youngjae: Then I will also ask a personal question! Jackson hyung~ Recently, you are a rising trending talent! The secret to being good at variety is? Isn’t it lonely going to schedules alone? Do you think of us a lot? Q: You had a showcase last Apr. 4 at Ryougoku Kokugikan where your seniors in the same company, 2PM, went to before. Looking back at it now, what kind of impression did it leave you? JB: I was very nervous. It left me an impression of fresh feeling. Anyway, it was the first step to our Japanese activities so I wanted to do my best. And I realized that I have to study Japanese more. Q: During that day, the MC was all in Japanese, right? Even though it was before debut, I really think it was amazing. 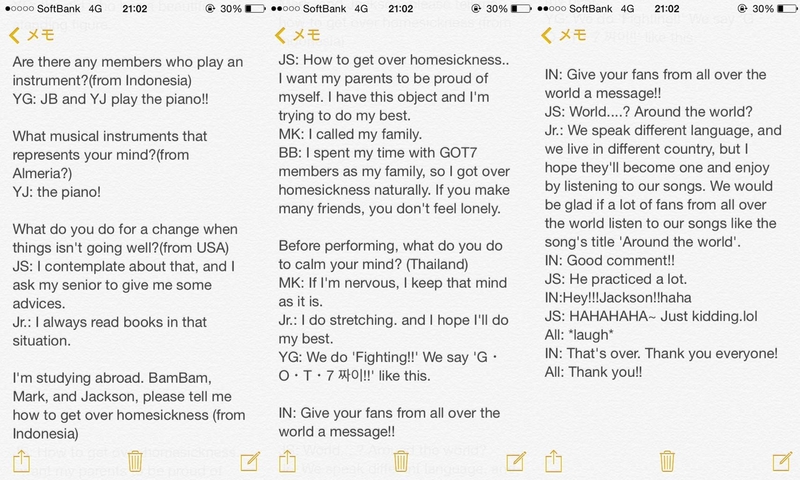 Jr: It’s natural that we should speak in Japanese. Mark: We started learning Japanese since our Korean debut. Yugyeom: Of course we’re also using textbooks but while in class, we also watch Japanese dramas. Even on regular days, we read Japanese manga and watch anime. I’ve watched this drama called “Yo nimo kimyou na monogatari (Tales of the Unusual)” and I really love this series. Jr: This drama called “Shitsuren Chocolatier” was good too. Bambam: I like SMAP and TEMPURA KIDZ! Mark: Kimura Takuya, Matsumoto Jun and Oguri Shun are great too. JB: Matsumoto Jun is good, right. And also Odagiri Joe. I also like music not just dramas. Jackson: Cocorico’s Endo is also good. And the “No-laughing” series of “Downtown no Gaki no Tsukai ya Arahende!! (Downtown’s ‘This is no task for kids!! )” is very funny. 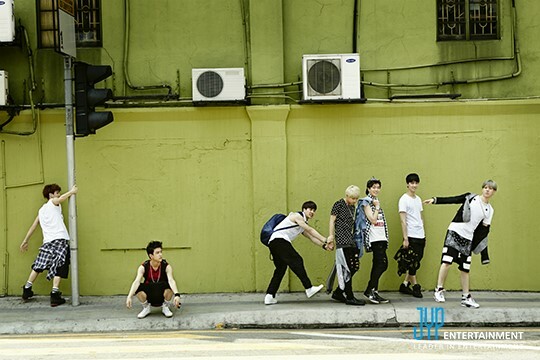 [STARCAST-Real GOT7 Season 2] The 6th episode, GOT7 shooting pictorial photo & riding skateboard! Hello~~~ Real GOT7 has come back in a week! Have you all had great Chuseok (Korean Thanksgiving Day)? This week’s episode is also full of exciting stories as Chuseok~! Let’s meet GOT7 shooting pictorial photo and riding skateboard!!! HELLO~! This is Mark! I’m so happy to introduce Real GOT7 Season 2! Summer in Malaysia, seven robust boys have come to catch the burning heat. They are 2014 Hot! Lucky GOT7 who brings in bright and healthy energy to all of you. Their exuberant energy have seized power over Malaysia’s hot summer. Let’s go to Malaysia with GOT7, a vitamin idol who will cool off this hot summer!